Very often (especially among us academic types) we tend to read a snippet of news here, a blog post there, and maybe have a conversation with a friend about a topic and, suddenly, our minds are made up about that topic. There’s nothing more to learn, to additional evidence to consider. This is especially true when it comes to important issues like religion or politics: we want stability, so we grasp whatever affirms our worldview as quickly as possible. Sometimes, however, its good to undergo a bit of “paradigm realignment.” That is, it’s good to engage sources that stretch (or even break) the limits of your worldview by forcing you to consider evidence outside the realm of what you normally think about. And for well-off Americans, one such topic is poverty. One resource which led to a paradigm shift in my own thinking is the book Life at the Bottom: The Worldview that Makes the Underclass by Theodore Dalrymple. In this powerful book, Dalrymple, who served as a physician in the United Kingdom’s National Health Service for many years, recounts many of his experiences as doctor to those living in poverty. Dalrymple’s commentary is insightful and important, the first-hand accounts of a man who has extensive experience with the worldview that makes the underclass (to say nothing of his insights into the realities of socialized national healthcare). 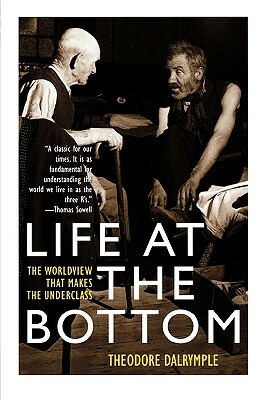 I highly recommend you consider buying Life at the Bottom: The Worldview that Makes the Underclass and reading it for yourself. To whet your appetite, I have included links to several of the chapters which may be found online. Do read this book–you won’t regret it.